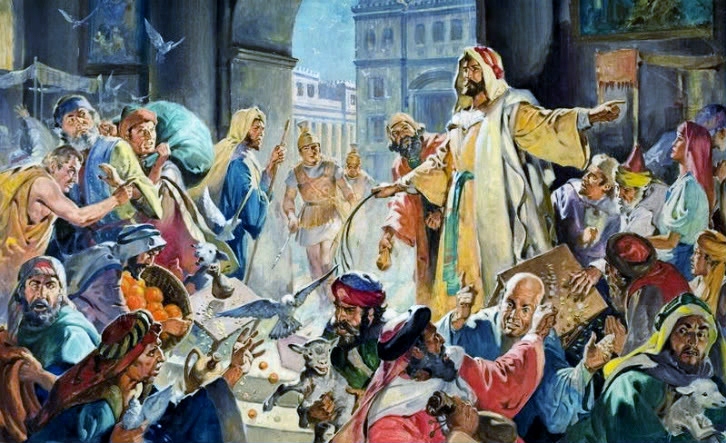 This Monday of Holy Week 2019, we read of Jesus’ cleansing of the Temple in Jerusalem on the Monday of that week (see Matt. 21:12-17; Mark 11:15-19; Luke 19:45-48). As we continue to follow Jesus on his way to garden, cross, and tomb, I have wondered: What would happen if Jesus, son of God, did it again with respect to the Temple? What if he overturned the platforms on which purveyors of religious amusement or liturgical diversion plied their trades? What if he put a strict quarantine on what should be, what in fact has been dedicated as, holy precincts, at least for a time no longer allowing anyone to pass through as they’d become accustomed? What if Jesus did it in protest of the many ways those who name and claim him as Lord and Savior refuse to follow him all the way home, to the place he has planned, organized, suffered and died for, in order that it might become a gathering space for all the homeless, the hapless, the hopeless, the people with nowhere else to go, who wouldn’t know what to do should they ever arrive there, the broken and hurting who wouldn’t be well enough at first even to know what sort of place had received them, the aimless and feckless who might as likely ruin the place than rightly appreciate the place, the unworthies, the low-lifes, the nobodies, the disgraced and the shamed, the people more accustomed to garbage piles whose Wal-Mart is the local landfill, and all the other people who would never come to such a place on their own, who in fact would avoid it for fear or contempt or confusion over the people who are typically found there? What if Jesus did it again, cleared and cleaned the place out, calling a halt to the normal and routine things and practices of the place, creating the most awkward kind of silence and embarrassment and wonderment for the people who are in charge of the place, all in order to remind any who could hear–that the place was never meant for them, at least not for them alone and perhaps not for them as they are now? What if Jesus could signal a radical return, a renewal and recalibration of the place for all who most need what is abundantly available in that very place as it was designed to be–a place where invisible and visible intersect, where the creator of all reveals himself as redeemer of all, where the one who holds everything together puts things and people back together as they were meant to be, where all that is not right gets a response from the One for whom nothing matters more–not even his own life–than setting right everything and re-establishing what is right and good and beautiful? What then if the only people he allowed to enter and move freely through the place were precisely all the “wrong kind” of people? (People perhaops on the mend, but with a long way to go.) I mean, what if this became the new order of the day? !